As I step onto the tee, my mind goes to the green. Before I decide which club to hit or how to play my tee shot, I want to know the exact position of the flag - once I know that, I play the hole backward in my mind. 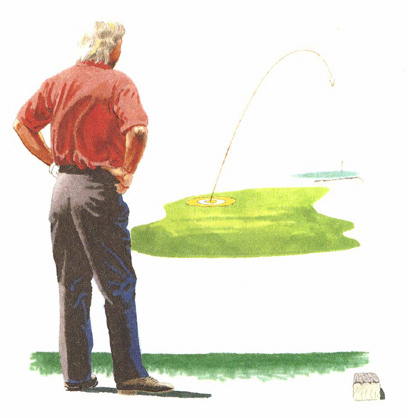 If I know, for instance, that the pin on a par-four hole is cut on the right side of the green, behind a bunker, then the best approach to that pin will usually be from the left side of the fairway, with a shot that will not have to cross over sand. Thus, I'll want to hit a tee shot to that left side, assuming there's no dire trouble to dissuade me. This usually means I'll tee my ball at the extreme right side of the teeing area and aim slightly leftward, toward position A.
I recommend that you do this type of 'backward thinking' on any hole where you can see the location of the flagstick from the tee. It's a bit like playing pool - you use the shot at hand to set up the ideal situation for your next shot.